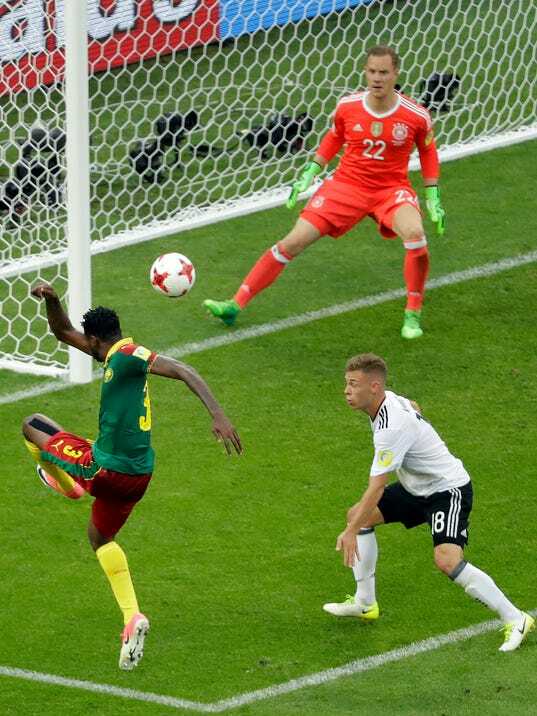 SOCHI, Russia (AP) — World champion Germany reached the Confederations Cup semifinals on Sunday with a 3-1 victory over a Cameroon side reduced to ten men after further confusion with experimental video replays. Germany was leading through Kerem Demirbay’s 48th-minute strike when a case of mistaken identity halfway through the second half that replays were meant to eradicate left the African champions bemused and irritated. Sebastien Siani was dismissed for a foul challenge on Emre Can after referee Wilmar Roldan inspected a pitch-side monitor. It took furious protests from the Cameroon players, including Siani sarcastically applauding Roldan, for the Colombian to check the monitor again and discover he had sent off the wrong player. Siani was called back on and Ernest Mabouka was correctly sent off.